JayWalk - All Your Xmms Are Belong To Me: Smart Or Stoopid? 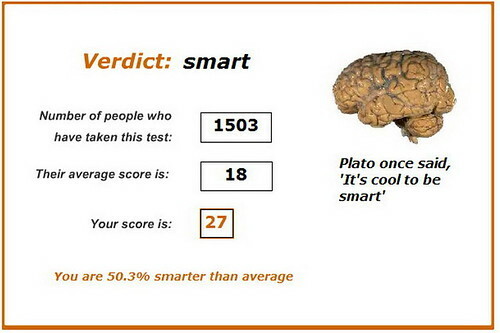 Got this "Smart or Stoopid " test from Lancerlord and I thought why not give this a shot. As it turned out, my score was kan si lang hor pretty good, so of course must post up and hao lian a bit mah. OK lah... truth to be told, this test is more of a general knowledge test more than one of those IQ test and as such, having a higher score does not necessarily mean that you are smarter. Just that you know more stuff. That's all. sollie.. me no have general knowledge.. whahahahah! **The Smart or Stoopid test is purely meant to be a fun quiz to see how your IQ rates alongside the average, based on the scores of other people who have taken the test. Naturally, only stupid people would take it as a true indicator of intelligence, and only intelligent people would take it as a true indicator of stupidity. Or something like that. Aloe: Acquiring general knowledge has been a thing that my folks encourage since young. I love reading and learning about new stuff even though some may be useless but interesting nevertheless. e.g. If you drop a drop of whiskey onto a scorpion's back, it will sting itself to death. Spinnee: Like said, this is merely a general knowledge test. Even so, it is not accurate since general knowledge cover such a wide base and as such cannot be represented by a mere 30 questions in a quiz. One can never sneeze with his/her eyes opened. Akk: Don't fret. Quite a few questions were american-centric. I just lucky to know when Elvis died and which US President was at the end of WWII, just to name a few. The correct number of espresso beans in a Sambuca is 3. Sunflower: I think you shouldn't worry so much about the results. If you fail to get the answer right, then perhaps you should try to find out and learn something from it. The reward from this is not the high score but the fact that you learned something new today. Go ahead and try it! In the old days, milk tea is prepared by adding a spot of cold milk before hot tea. The cold milk acts as a buffer that would prevent the hot tea from cracking the base of the cold porcelain tea cup. But you are absolutely right about the time pressure. I think I may have answered a couple of questions wrong coz I kar lang kar bok click wrong answer. Barbie's (the doll) full name is Barbie Millicent Roberts. Jaschocolate: Maybe that's what most people do. Anyhow click! LOL. Walt Disney, creator of Mickey Mouse, was actually afraid of mice. Jay - I took the test. I also scored 27. Guess that's why we are brudders !! Meepok: Brudder!!! Whem you coming up again har?